Today the group visited Waseda University in Japan. This University was very nice pertaining to modernity and the way in which the building was kept up. When we first arrived we met a fellow American who has been teaching at this university for years and who allowed us to come and visit and take from this experience what we could. After we sat in his class for a little over an hour it was time for lunch. The cafeteria wasn’t the greatest mainly because they didn’t have one. They had a store they sold food that could be micro waved or just eaten cold. After I bout some noodles and ate them I made my way to a Waseda restroom. When I walked into the stall I saw this foreign toliet again but this time I was a bit confused. I didn’t see the lever to flush the toilet at first because it was blocked by another part of the toilet. So when I look to my left I saw a red string so I think to myself this must be the flusher, so I pull it. Once I walk out the restroom I hear a faint siren of some sort and a Japanese security guard running at me, at that moment I realized that it was not a flusher. The people of Japan seem to have a very mundane life. They go to school or work come back what seems to me as extremely tired, they sleep on the subway, eat and go home. Then there up the next day to do it all over again. Japan is a very strict country, they have a lot of rules and expectations for their citizens and one of the highest ones is hard work. Very hard work is how I categorize it seems as if they have no fun whatsoever and they’re walking around as if programmed. I didn’t see a group of native people having fun until I attended the baseball game near the end of my trip. 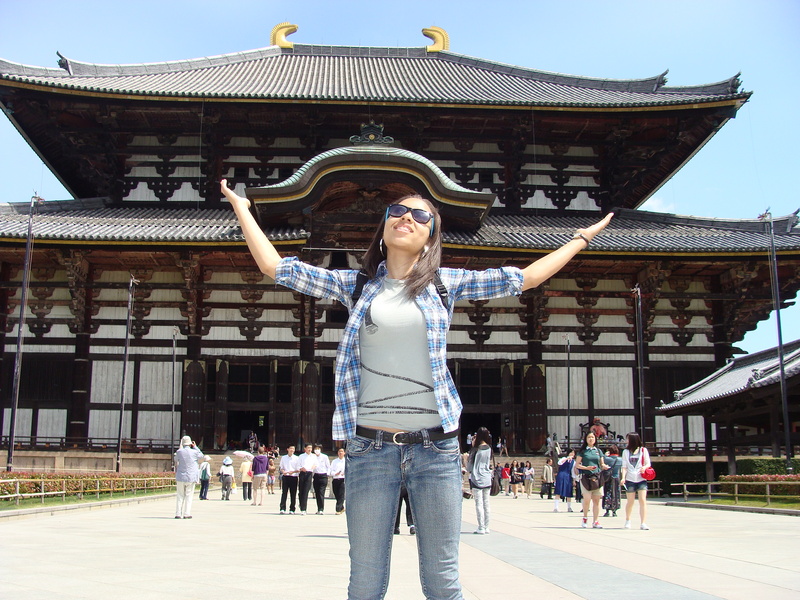 I learned a very disheartening fact about Japan deaths while I was studying abroad. There are a higher number of suicides every year than there are murders in Japan. Many of the suicide attempts happen at the subway stations, because of this more and more subway stations in Japan are taking major precautions by building a safe wall to cover up the edge of the track to prevent jumpers from committing suicide. After visiting Japan for the past three weeks I decided to make my technology review about the toilets of Japan. I know what most may think, how can toilets fit in the category of technology? Well it fits within this category because the toilets of Japan are not just any run of the mill toilets. I never thought I would ever enjoy having to take time out of my day to visit the restroom but while studying abroad in Japan one of the highlights of my day was visiting the facilities. The bathrooms alone were impressive. My first experience with the bathrooms of Japan occurred after checking into what I would call a three star hotel in Japan. I walk into the bathroom that in my mind should be the least foreign aspect of my trip, and I was immediately confused. For starters the tub was shorter in length in comparison to American bathrooms but deeper in depth. The showerhead was adjustable in length and water pressure. I felt like I was in a very different world. After exploring that side of the bathroom I made my way to the toilet. As soon as I set eyes on it I was immediately impressed. All of the toilets are not completely the same in Japan in fact in some public restroom that are placed in lower class areas such as the subway system, they don’t even have toilets. In some subways public bathrooms there are just holes in the floor with a flush know on the wall. But the toilet in my hotel room was so very high tech. On the side of the toilet there are a series of buttons. These buttons are not just for show they actually have many useful purposes for being there. The first button I noticed said spray. That is when I came to find out that this toilet was not just a toilet but it worked as a bidet as well. I personally never used this button because I just could not wrap my head around the fact that clean water could come out of such a dirty bowl. The other buttons that were on the side of this high tech contraption were labels that read adjust, mode and flush. The adjust button I really did not understand fully, I pressed it but I did not notice anything really change. The mode button only worked in one way that I could tell. Apparently you can change the sound of your flush if it’s not appealing to your ear. The flush button in my opinion was not needed because there was also a handle on the back of the toilet to flush by I believe the button on the side is more for convenience and luxury. The toilet in my hotel room was nice but it was nothing compared to the toilet that I saw at NTT DoComo that is a successful technology company in Japan that also produces the majority of the cell phone business in the country. The toilets in there public restroom had heated seats. I was so astonished, and in order for these heated seats to work all of the toilets were plugged up to the wall. Which now makes them electric toilets as well. 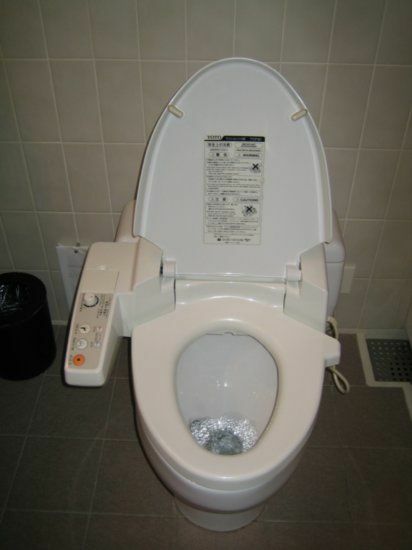 Heated seats on a toilet are one of the most intelligent inventions of technology I have seen thus far in Japan. On the side of the Toilets at NTT DoComo there sat a radio and an option to make flushing noising even when the toilet is not being flushed. I think this aspect of technology will come in handy when a person wants their private time to stay private and the music and flushing noises will drown out the sound of the toilet being used. I absolutely loved my experience with the restrooms in Japan. The day I buy a house and have enough money to splurge on the finer technologies in life these toilets will definitely be my first purchase. Simply Incredible. Today I went to visit about two Japanese temples. One of the temples I visited was Todai-ji Temple. The outside of this temple looked so beautiful. Once I walked in the first thing I saw was a very large statue of Buddha. This Buddha was about as big as the temple itself. There were many people in this temple observing the magnificence of its art. I saw a lot of school children that seemed to be there for there a field trip. The culture is very different form that of America. There were about 60 elementary age kids there on this field trip with only two chaperons. I have also noticed the difference in culture with the children by observing five and six year olds taking the subway trains by themselves to get to school. That would never happen in America and the main reason that it would not happen is because there is a lot less crime in Japan than there is in the United States. There are more suicides every year in Japan than there are murders. After such a wonderful day in Hiroshima, we jumped on the bullet train back to Osaka. This bullet train moves at least 130 mph if not more. I couldn’t believe how fast the scenery was moving around me or rather how fast we were moving pass the scenery. Once I arrived to Osaka I immediately changed my cloths and went on a mission to SHOP! Osaka has the most stores I have ever seen. This is the shopping district of Japan if you ask me. I walked in store after store seeing a wide arrange of culture. There was such a different style of clothing in these stores and such a new way of creative expression. I loved it. I enjoyed myself so much that I decided to do go by the saying “when in Japan do as the Japanese” so I went into a store and bought a couple of harojuku items of clothing along with other merchandise of the Japanese culture. Today I felt like I step on history. 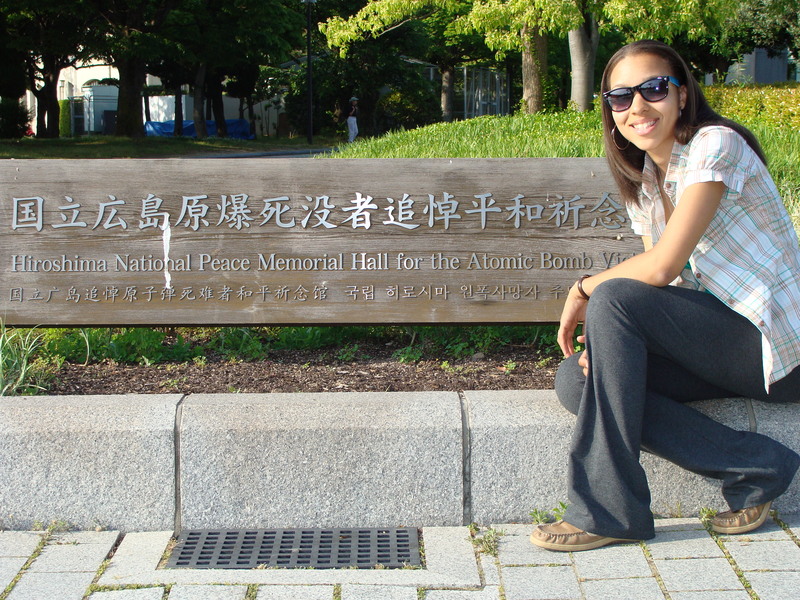 My group and I went to visit the site of the atomic bomb dropping on Hiroshima. I visited the Hiroshima Peace Memorial Museum. I consider myself a history buff and I was so excited when I realized that I would be able to visit such a large part of Japanese as well as American history. After walking through the museum I feel as if I left knowing more than I did going into the memorial. I saw with my own eyes how harsh the bombing was and how it affected the Japanese people as a whole. In the memorial I saw burned clothing that once belonged to children that died in the bombing. Innocent sons and daughters’ dead, shoes lost book bags scattered all because of the choice my country made to bomb and entire city. This visit was most definitely an eye opener for me. I was able to see the tragedy through the eyes of the Japanese. Seeing what they saw wasn’t very difficult due to the fact that the Museum had life size wax sculptures of some victims bleeding and melting from the atomic blast. After a somewhat long train ride the group and I made our way to the fairy. This fairy was our transportation to the Island of Miyajima. This island was so nice. 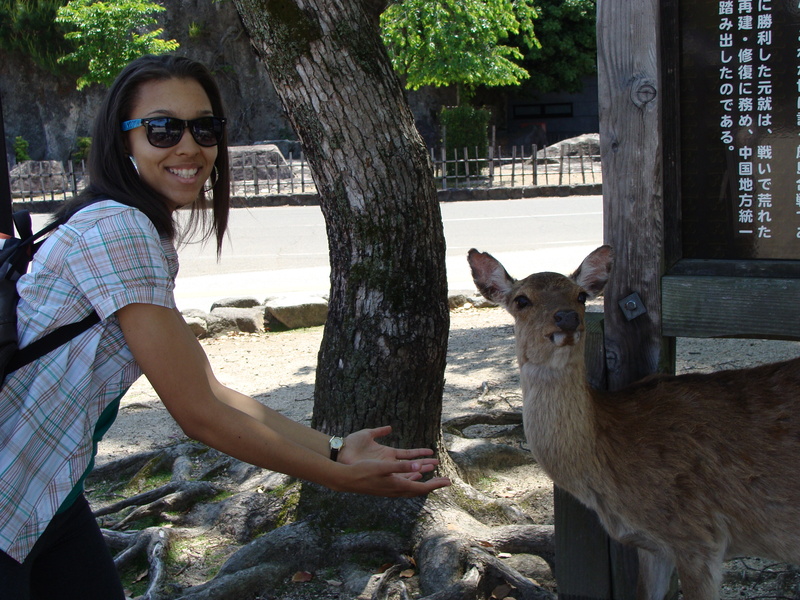 Not only did it have the best ice cream but also there were deer just roaming around the island like it was normal. These were the most peaceful deer I have ever seen, the locals as well as the visitors to the island are allowed to feed the deer and touch the deer as well. Things like this just don’t happen in the states everyday. I never thought I would be able to get this close to a deer let alone feed one. After feeding the deer and walking with them I made my way to the temple at the top of the island. On the stairs leading to the temple there was native writing all over the sidewalls and steps. I also noticed statues of Buddha with Yen placed on top of it. I was told that placing money on the Buddha should produce good fortune for the ones who left the money. After entering the temple all I saw were statues of the deities and wooded squares with what looked to be prayers written on them, placed there by different visitors.